Postcard Basics, originally uploaded by shindohd. I went to Blick’s in Little Italy and I picked up some postcard paper and glue sticks. I normally get the Strathmore Watercolor Postcards (4 x 6), but I could not find them where I found them last, a special section for artistic cards. Instead, I found Canson Watercolor Postcards (5 x 7) and decided to try them out. When looking for 100 lb paper to cut into 4 x 6 rectangles, I found the Stathmore cards in the drawing paper section. Glue sticks always come in handy for collaging. I like to use purple UHU glue sticks because I can see the glue while it’s wet. I don’t like to use liquid qlue because it wrinkles paper. It’s stronger, but I work better with glue sticks. Pencils are handy to have around for sketching, planning, etc. Exacto knives are a collage artist’s best friend. I got exposed to them in design school, and scissors have never been adequate afterwards. The advantage of the Exacto knife is that you can hold it like a stylus. However, handle with care. I’ve gotten my fair share of nicks and cuts over the years. 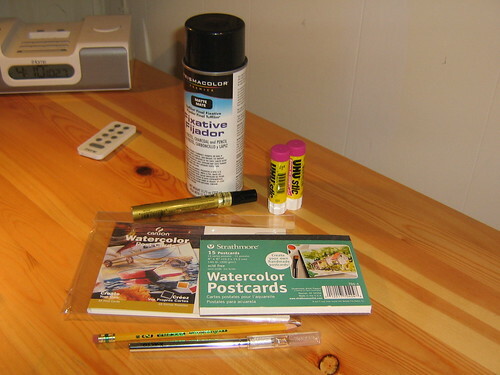 Fixative is good for collages or chalk drawings (which I also like to do). I prefer a flat fixative, though glossy has its uses. Both of them have a way of ruining the original effect, but it’s minimal with the flat. Gold marker is a staple for me largely due to having done the Gold Lady images over the years. It’s still great for putting the finishing touches on her image, but I also like using the pen for other effects. I also picked up some tracing paper, which can add some interesting elements to the cards. I can make tracings or I can use tracing paper to temper some bright marker work among many things. In general, I hate being in the art store. Oh, I really love it. What I hate is that there are so much art supplies I’d love to have, but so little cash. Prismacolor markers and pencils beckon me as do paints, brushes, inks, papers, and tools. It’s just a matter of determining what I need vs. what I want. I’ve always loved to draw. Art supplies (pencils, pens, paper) are necessities for me. Otherwise, I’d doodle and scribble on a wall. When I was a kid, that was completely unacceptable. As an adult, I can claim I’m doing a mural. Well, if it’s not my home, then it’s graffiti.Don’t feel bad about algebra. I never got into it either.